Many, many moons ago, I found a page in a magazine that looked like a piece of aluminum foil. You may remember it. It was an advertisement for Reynold's Wrap Heavy Duty foil. 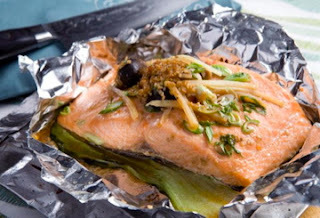 It had instructions printed on it for cooking individual entrees with vegetables in a foil pouch, in EIGHTEEN minutes! I remember having these as a kid when camping with my family. I'm not sure why, but we called them hobo dinners and cooked them on a grill or in the campfire. 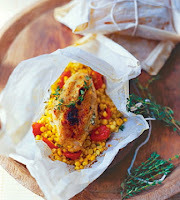 Restaurants serve things in parchment paper tied with kitchen twine. They are lovely and equally delicious, but if you're not Martha Stewart and don't keep parchment or twine lying around, then this is the post for you! Through the years, I have cooked chicken breasts, various types of fish, ground beef patties and even pork chops in a pouch, without a bunch of pans to clean. You're excited already, aren't you? The secret is not to overfill them. Remember, it is one serving and you have to be able to close it up. Each pouch should roughly be the size of two magazine pages, or approximately 11" x 17." Boneless chicken, thighs or breasts. You can use any firm fish you prefer. Ground beef patties or pork chops would work, but must be cooked a little longer. If you are meat-free, just add more veggies! Fresh garlic, minced, use lots of it. Assorted fresh vegetables: zucchini and yellow squash; onions, scallions or shallots; any kind of fresh mushroom; carrots, asparagus, pea pods, bean sprouts, tomatoes, etc. Herbs such as thyme, Italian parsley, rosemary or cilantro. 1 or 2 tablespoons of liquid for each packet. Fruit juices like orange, lemon or pineapple; sauces like teriyaki or soy, barbecue or steak sauce; dry white wine or sherry... or mix it up! 1 tablespoon of fat for each packet, such as olive oil or butter. Place boneless chicken breast on foil. Season with salt and black pepper. Top with onions, garlic and a few canned apricot slices. Stir together lemon juice, apricot jam and one tablespoon of melted butter. Pour over items in pouch, fold as directed and bake. Serve with mashed potatoes or yellow rice and some steamed broccoli. After choosing your ingredients, lay out each piece of heavy duty foil and fold in half to crease. Open up and spray with cooking spray. Place meat in the center of one side. Season with salt and pepper. 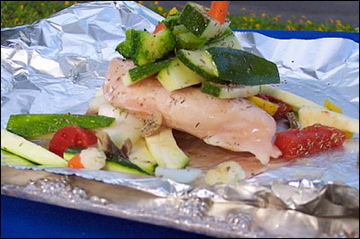 Place veggies, fruit, herbs and garlic on top and around meat, staying on half of foil. Turn up edges and add liquid and fat. Fold in half. Make a small seam around three sides. Make another tight folded seam around same three sides, making sure pouch is sealed. Pull up the center just a little to tent it. Place pouches on a baking sheet with sides. Don't crowd them. You may need more than one baking sheet. Bake in a 450 degree oven for 18 minutes. The only complaint I have had with the foil method is the absence of browning. When food is done, I usually cut an X in the center of the pouch, peel it back a little and let it brown in the oven for a minute or two. Be careful not to let the liquid leak out. Empty foil pouch onto a warmed plate and throw pouch away! Now aren't you glad you stopped by?